US, 1975, 114 minutes, Colour. 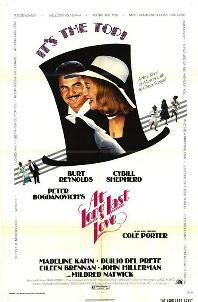 Burt Reynolds, Cybill Shephard, Madeline Kahn, Duilio Del Prete, Eileen Brennan. John Hillerman. At Long Last Love shows how Peter Bogdanovich idolises old films and filmmakers and has (successfully) made his own films modelled on theirs. Now he attempts a 30s style musical with Cole Porter songs and idiosyncratic lyrics. The film looks good - 30s sets and costumes; has good supporting stars in the comic Madeline Kahn, Eileen Brennan, John Hillerman; relies on the charm of Burt Reynolds and Cybill Shephard (not as bad as many critics affirmed). The result is a frothy piece of entertainment whose success will probably rely on the mood of the audience, (since it is not compelling), on the liking for musicals, and for the ever-present Cole Porter songs. 1. World enjoyment of American musicals? Their changing styles over the decades? The particular characteristics, appeal, music dances, fantasy plots, type characters? Comedy? 2. This film's screenplay in the light of the traditions of the American musical? The plot itself. the characters chosen and their interactions? How real, unreal. types? A celebration of the American musical and its style? 3. The harking back to the style of the thirties? A faithful reproduction, the point of view of the seventies? The ingredients of screwball comedy of the thirties. its appeal, wacky exaggeration in character and plot? Audiences willingly and humorously suspending disbelief? A wealthy world, a romantic world. A piece of Americana? Colour styles. stylized colour. black and white and pastel colours? The importance of costumes and sets? 4. The film was meant to be a celebration of Cole Porter and his music. The appeal of Porter's music. lyrics? The frothy artificiality of his songs? The reputation over the decades. Used in previous musicals? Their staging in this musical by non-musical performers? Spontaneous., unpolished presentation. 5. The reality and unreality of the plot? Romance? Observation of this kind of thirties comedy plot. parody? The satire on American plots? 6. The importance of wealth, could these musicals function in a poor environment? Michael Oliver Pritchard 111 and his style, way of life? Money? His mother? The importance of having Rodney James as his manservant? The impeccable style of the manservant? A figure of the past. of comedy and style? 7. The contrast with Kitty O'Kelly, the music hall background? Her real name, her style? 8. Brook Carter and the glamorous society girl? Elizabeth and the down-to-earth companion and maid? The humour in Johnny Spanish, apparently wealthy, con-man? 9. Comment on the importance of the settings for the action. romantic complications, songs and dances for example the theatre, races, the shops, driving? The ability of the performers to sing and dance? 10. Mrs. Pritchard and the expected mother-figure? Humorous, satire? 11. The merry-go-round of love, confusion? Jealousies? A humorous presentation of romantic plot? Elizabeth and her commonsense and helping things to be normal? Elizabeth and Rodney James? 12. The happy romantic ending - how else could the film end? 13. The value of the lightness, whimsy, romantic comedy, fantasy, picture of an unreal yet happy America? A tribute to musical comedies?